Nope. But I’m so glad to finish the movie! The ending paid off my time. 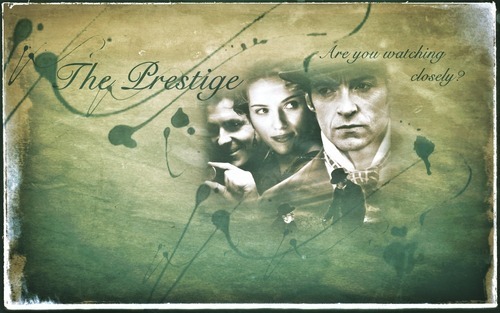 What can I say about The Prestige. It was my cup of tea but the presentation not really my favorite, but the taste is definitely one of my favorite. Confuse? me too.. hehehe. Basically the premise and the idea is one of my favorite kind a movie, a movie that keep you guessing, and twist all your thought in the end, that was my cup of tea kind of movie. Basically it’s about rivalry between two magicians.The rivalry started by an incident which made it into revenge. How this two tried to beat one another with the best and innovative trick to amaze the audience. I love the whole idea and the twist and all the discovery in magician/ illusion trick, I was amazed. But to tell the truth the package is a little bit boring for me. If I didn’t have the patient, I might be ending up not appreciate this movie at all, coz the whole idea, the main story and all the twist was in the end with slow pace in the middle about the rivalry and how they ruin each other show. It was too slooooooooow for me. But the last 20 minutes were my favorite, starting to get what the idea behind the movie and the last 10 minutes was brilliant to ruin all the thoughts that I had made during my watching. It never occur to me how much crazy dedication did Alfred Borden (Christian Bale) has. And poor Robert Angrier (Hugh Jackman), he has such sad and apparently silly obsession toward his rival Alfred. Both actors acted well. But I couldn’t understand John Cutter (Michael Caine) character here. Did he betray Angrier? Why I feel like he helps Borden in the end, when all this time he was so helping to Angrier? And Tesla (David Bowie), was he only meant to create the magic box, and then gone? Olivia (Scarlett Johansson) first quite interesting how she has her own characteristic and never one dictate her, but shamelessly she kinda disappears after worked under Borden. The movie itself works forward-backward-forward-backward, hahhahha.. but that was good keep us thinking did this scene happen in the future or in the past or current situation. Love show that makes me think. smart. The TWIST = LOVE IT SO MUCH! make all the hours watching this worth! And once again I love all the twist! wish they make it more interesting pace in building the story to the twist.